As of the 14th May 2018 the Child Brain Injury Trust launched a new support service for young people with acquired brain injuries. The launch coincided with Action for Brain Injury Week. Many children and young people experience difficulties both in school or college and in the outside world due to brain injury. These difficulties can be exacerbated when they are in situations with people who are unaware that their behaviour may have such a cause. 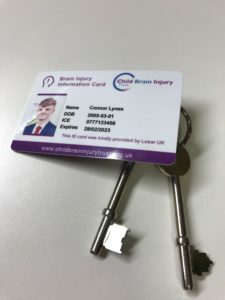 Offering young people a personal Brain Injury Information Card is a great way to support their independence and to help others to better understand the potential impact of their injury. nasen’s hope is that this initiative is another positive step towards increasing awareness of neurodiversity in all forms and particularly of the issues surrounding brain injury. One of the challenges of acquired brain injuries is that it is often not immediately clear or obvious that a person has a condition. For children and young people this can affect the way they are treated, and how others engage and interact with them. Raising awareness and improving understanding and recognition are key to addressing this. Initiatives such as Brain Injury Information Cards can play an important part, helping to make sure young people get the support they need and giving them added confidence in their day to day lives. This is an excellent initiative by Child Brain Injury Trust that has the full support of Police Scotland. The Brain Injury Identity Card for young people under 18 will help ensure that police officers respond appropriately and deliver a service according to individual needs. Brain injury can lead to a wide range of difficulties in young people. Some are obvious but may be mistaken for other conditions such as rudeness, poor behaviour or even intoxication. Some are not obvious at all, meaning that appropriate allowances may not be made for the young person. 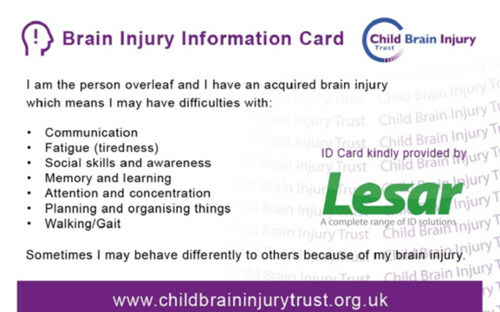 In either circumstance the Young Person’s Brain Injury Identity Card provides a vital source of identification and information in a range of social situations – I fully endorse the distribution and use of these cards. The Child Brain Injury Trust are deemed to be the card issuer.